We are looking forward to a wonderful Market season in the heart of Ridgway Colorado. Don't Forget that the Ridgway Farmer's Market will be Thursday, August 11th this week due to the Ridgway Rendezvous taking place in Hartwell Park. Ridgway Farmers Market Same Time (10 am) Same Place (Hartwell Park, Downtown Ridgway) DIFFERENT Day (Thursday, August 11th) We'll be back to our regular schedule next week. Buy Local. Celebrate Summer. Enjoy your fresh prepared breakfast, lunch, or pick up something for dinner from one of the many regional restaurants that will be at the market. Enjoy live music under the shade of the park trees presented by local, regional, & national artists every week. Help us celebrate summer with our first market of the season Friday May 27th in beautiful Hartwell Park in Downtown Ridgway. Enjoy live music by first week's artist Jacob Green (http://farmersmarketridgway.us2.list-manage.com/track/click?u=0f459ad950c1ccf31a52a99cc&id=869a355cda&e=11c36e2cff) , have a healthy prepared lunch in the shade and stroll through the market with vendors selling fresh fruit & vegetables, sustainable meats, fresh eggs, organically grown food, local wine, arts & crafts, fresh cut flowers and handmade soaps & lotions. Copyright © 2016 Ridgway Farmers Market, All rights reserved. Celebrate Summer in Ridgway Colorado at the 16th Ridgway Farmers Market. AND in a new location! (next to Taco del Gnar), Ridgway, CO. The Bin: Breads & pastries. Hawk-n-Yak Ranch: Frozen yak meat, cookies, cards. Handmade Simplicities by Nedy Leavins: Kitchen essentials, aprons, pot holders/oven mitts, table runner, tote bags, bowl cozies, heating pads, etc. and home cooked jams and pyrography. Katwalk's Artisan Jewelry: Necklaces, pendants, earrings, bracelets. The Gardens of Eatin': Salad greens, lettuce, spinach, mustard greens, collard greens, radishes, turnips, microgreens, horseradish root, beets, carrots, winter squash, sugar pumpkins. Living Springs: Pears, pak choi, carrots, beets, potatoes, winter squash, pumpkins, hakueri turnips, spinach, lettuce, kale, chard, leeks, ching onions, regular onions. Buckhorn Gardens: Asian greens, carrots, beets, potatoes, onions, garlic, chard, lettuce, radishes, turnips, spinach, arugula. Love In Every Bite: Home-baked cookies, pies, pastries. Because it will be fun! These two Farmers Markets are the last of the season. Come stock up your pantry, freezer, fridge and belly with our local yummies - and get your Holiday Gifts from our local artists and friends! MARKET MANAGER POSITION OPEN - APPLY NOW! The Ridgway Farmers Market is now accepting applications for the Market Manager position! We are looking for an innovative, service minded, joyous person to be part of our core staff. We are looking for someone who is eager to help us expand and maintain our precious farmers market, someone who is interested in community and who values healthy living and healthy foods! Duties include, but are not limited to, setting up/taking down the market each week, assigning spaces each week, directing vendors to assigned spaces, answering phone calls, emails, and other tasks assigned by the Board of Directors. And the rest of the crew want take the opportunity to thank Marietta for the work and heart she has put into her time as a Manager for our Ridgway Farmers Market! Market Dates for 2015 Announced! The Ridgway Farmers Market dates for 2015 have been set. The market will start on Friday, May 22nd and will take place every Friday until October 16, 2015. Like last year, it will run from 10am-3pm every Friday. We are currently accepting vendor applications and musician requests. We are also actively seeking prepared food vendors for our market and will waive all fees for all seasonal applicants that meet this need. First, the bin wants to sincerely thank all of you for an amazing Farmer's Market season! I will miss seeing you in the park each week! But the good news is we will be offering winter deliveries. I anticipate the first delivery the week before Thanksgiving. 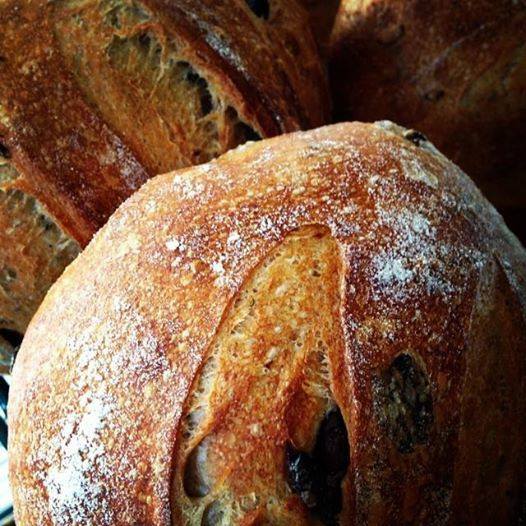 You can always visit the indoor winter Farmer's Market in Norwood on Saturdays from 10-12 for the bin's breads and pastries. And feel free to special order all winter. Design and creating have been an interest of Deidra’s for most of her life. She focused more time on honing her interests and skills at Colorado State University where she graduated in 1997 with a Bachelor of Fine Art degree with a focus in fiber art. She quickly moved to Telluride, put her loom and spinning wheel in storage and started working at the Ah Haa School for the Arts as their clay center manager. This is where Deidra’s love for working with clay blossomed. She put her art on the back burner for 10 years while she focused on being a mother, building a house in Ridgway and starting a business with her husband. When Weehawken Creative Arts opened a clay center in Ridgway in 2012 and her children were all heading off to school, Deidra was inspired to begin creating again. Dusting off her skills and interested in making a statement with her work, she began throwing simple forms and stamping words of inspiration into her pieces. The words flowed into uplifting quotes and then to the poetry of her friend Erika Moss Gordon. 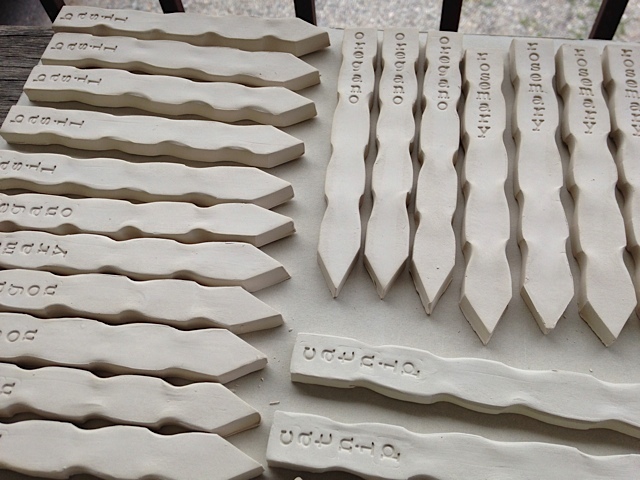 Deidra’s pottery has grown into a line of simple, modern functional and decorative pieces incorporating words, quotes and poetry accented with hand-drawn underglaze designs. Her offerings include magnets, ornaments, garden markers, wall plaques, wall pockets, mugs, tumblers and bowls. Deidra’s main inspirations are her family, nature, travel and a simple functional design sense. She finds that her customers are looking for fun, creative, inspirational gifts for themselves and special people in their lives. Deidra is most interested in making art that makes people smile, wonder, create, and act. Currently her pottery is sold at the Ridgway Cafe (ice cream shop), some Friday's at the Ridgway Farmers Market, seasonal art fairs and through email – make sure to check out her website too! Deidra’s vision for Wishing Star Pottery is to create pieces that motivate you to enjoy life, make the world a better place and be happy.......EVERYDAY! The future of Wishing Star Pottery is to go global. And, Deidra is currently focusing on a line of pieces for sale in her online Etsy shop......so, stay tuned! Make sure to check out the links below for amazing holiday gifts!! Marietta, part of Gardens of Eatin', says "I used to despise gardening back in the days when I was little and my mom and dad forced all six of us kids to help plant, weed, water, and harvest the garden. But gradually, my parents' lives began to get too busy for them to be able to garden, and so it became my sisters and my responsibility. I'm not sure at what point I started to like gardening. There was never like a 'moment' when I realized I was in love with it - it just became a part of who I am, and it became the center focus around which my life seasons revolved." Gradually the garden expanded and became too big to feed just the family. Some friends inspired the Gardens of Eatin' crew to try out a CSA, so they did. That, however, became a struggle because they had such limited experience with marketing. The frustrations grew, and the family were at a loss as to where and how we would market all of the delicious food they were producing. And that's when they found the Ridgway Farmer's Market. Marietta was sixteen and Maggie was fourteen when they first decided to "try one market and see how it goes." And it was a hit. A huge hit! And so, they have been coming to markets ever since. Although they produce food on a much bigger scale now than they ever have, gardening is still the highlight of their year - the thing they look forward to doing most. Marietta work part-time as a nurse at Montrose Memorial Hospital, and so gardening is her stress-relief and how she relaxes when she is not at work. “It's not just producing delicious food - it's a way of life for me. I could never be without it’, says Marietta. Currently, it is Marietta, Maggie, Luke and Malachi who does all the work. They garden at their parents' place, which includes 1.5 acres of potatoes, squash, cucumbers, corn, carrots, beets, greens, flowers, herbs, sweet potatoes, okra, peppers, tomatoes, and so much more. Their mission is to provide food to feed the family, and the local community family as a whole. And they provide fresh, wholesome, naturally-grown food. So, make sure to stop by their booth at the last Farmers Market of the season - and get yourself ready for winter, stocking up on some really healthy and yummy food items from Gardens of Eatin'! Meet Wag's World Orchards whose goal is to grow the biggest, best-tasting, best quality of fruit available to everyone at a reasonable market price. You’ll find their delights at the Ridgway Farmers Market – make sure to check out their booth! For a glimpse into their production, continue reading! Wag's World Orchards began over 20 years ago when Chris and Jan Waggoner went into business with Chris' parents, Jack and Betty Waggoner, apple growers from the Oregon/Washington area. Almost every fruit tree was replaced with a new vision for the future. The current operations have been a family farm since 1994, where Wag's World Orchards grows fruits and vegetables at the base of the beautiful Grand Mesa in Western Colorado. Today, Wag's World serves both the wholesale and retail customer with all kinds of fresh and local peaches, apples, cherries, plums, nectarines, berries, pears AND all kinds of fresh tomatoes, peppers, cucumbers, green beans, eggplant, herbs, lettuce, onions, squash, raw honey, jams, pie fills, dried fruit/veggies and more! The couple lives where Wag's World Orchards grows, above the stunning Tongue Creek Valley in Eckert, CO. Wag's creates a stewardship with the land that is both solicitous of the environment and affordable for the end consumer. The Wag’s home is right in the orchard, so that they can care deeply about the trees, the land and all the animals, birds and bees. They treat all with care, because they live on the land. The operations follow all local, state and federal regulations and take great care to lessen their carbon footprint. Their customer base is both wholesale and retail customers – serving customers in Mountain Village, Grand Junction, Ridgway, Montrose, Delta, Edwards, and on the Front Range throughout the growing season. 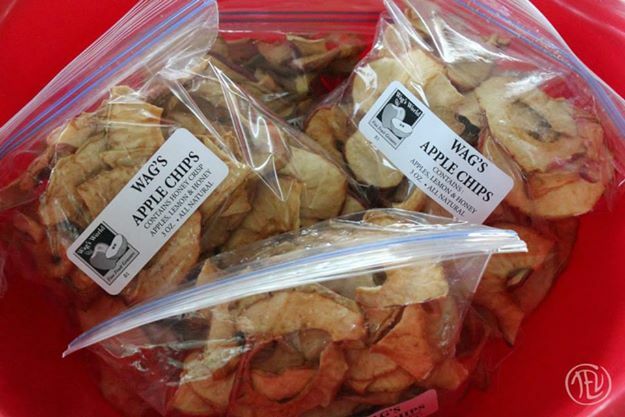 The dream and vision of Wag’s World Orchards is to serve their customers with the best fruit and vegetables available at a reasonable market price, and to produce the jams, apple chips and apple butter nationwide. Meet the Laid Back Ranch - and its awesome owners Sajun & Paula Folsom! Make sure to visit their Farmers Market booth for some grass finished beef, pasture raised eggs, and gluten-free baked goods! For a glimpse into the life on the ranch...continue reading! The Laid Back Ranch began when Sajun moved from California to Colorado to help his aunt, Mae, with her cattle. She encouraged Sajun to raise and market grass finished beef from her herd of Aubracs, a breed specially selected for its hardiness at high altitude, superior finishing on grass, and excellent temperament. Sajun met Paula a year after he founded the ranch, and Paula brought a passion for poultry and baking to the operation. They now have a ten-acre ranch in Norwood, where they raise chickens, ducks, and turkeys. All of Laid Back Ranch’s animals are raised exclusively on pasture, either on the ranch itself or on the 250 acres that make up multiple leases around Norwood. The large amount of acreage for their small cattle herd allows Sajun to move the herd quickly from pasture to pasture, ensuring the animals are always grazing on the best grass, and that the pastures themselves do not become over-grazed. On the ranch, the hens always have access to a two-acre pasture, where they are free to hunt for bugs, take dustbaths, and enjoy the sunshine. There are roosters and tom turkeys present in the flock, and part of the summer season involves allowing broody hens to set on eggs and raise chicks and turkey poults. Currently, the Laid Back Ranch serves Norwood, Ridgway, and Telluride. Folks can find them at the Norwood summer and winter markets, and the Ridgway Farmers Market in the summer. They also deliver their products locally, and invite customers to the farm to pick up eggs and beef. Sajun and Paula look forward to closing a lot of loops on the ranch, including breeding their own cattle and poultry, and growing their own poultry feed. They strive to be a positive part of a community that has been so encouraging and supportive. The Ranch couple are inspired by permaculture systems, other great farmers and ranchers, their animals, and each other. They are especially encouraged by the feedback from their customers. So, make sure to stop by their booth to talk to them and hear more about what they have going on - and make sure to pick up some of their goodies! If you haven't tried the potatoes from Rivendell Farm - or met John Cooley personally - you are in for a treat! Read more about the history of the farm and how John came to farm such amazing potatoes! John always knew that he would farm, though he never really had much of a garden, nor took any classes. His first experience farming was in 1976-77 at the foot of Mt. Blanca in the San Louis Valley, where the soil was sand. At that time, everything the potatoes needed was given to them through the water pumped through the center pivot sprinkler. Yes, they cultivated, fertilized, and for the most part it was pretty artificial. John would harvest, store the spuds in the cellar, then spray some sort of chemical on them to keep them from sprouting. They would last longer and ‘hold’ until they could get the ‘price’, then they would be washed, bagged, and put into stores. It was then and there that John realized that there was a better way of growing and distributing potatoes, and he was determined to grow spuds without any chemicals. The Farm was established in 1881 and is one of the oldest farms on the Gunnison River. John purchased the land in 1998, and the river flows on the north property line. The soil was sandy, compacted, white alkali, and extremely high PH. The field was uneven, filled with Tamerask and Russian Olive trees and brush. John started adding compost and organic matter to the soil, and his goal was to revive the 10-acre farm that was entirely depleted and to grow the best potatoes that he possibly could. Compost, cover crops, rotation and cultivation, was all key elements to making the soil healthy again. At Rivendell Farm the aim is to produce potatoes that taste better than anyone else’s and that are more nourishing - and to treat the Earth with care and enhance the land of the Farm. One can taste the minerals that have been released from the soil into the crops produced at the Farm, he says. Currently their main crops are: potatoes, onions, garlic, tomatoes, sweet corn, lettuce and peas. The farm has been Certified Organic, and certified naturally grown. As of now, their practices are leaning more towards Biodynamic. CLICK HERE to read an article written about Rivendell Farm & John Cooley, by the Telluride Farmers Market. CLICK HERE to link to Rivendell Farm's Facebook Page. Danelle Hughes Norman grew up in Roanoke, Virginia. She lived for eight years in Eugene, Oregon, where she apprenticed under ceramic artist, Caroline Osborne-Sommer, before moving to Colorado’s Western Slope in 1999. Danelle earned her BFA in Art Education from Colorado Mesa University in 2008. 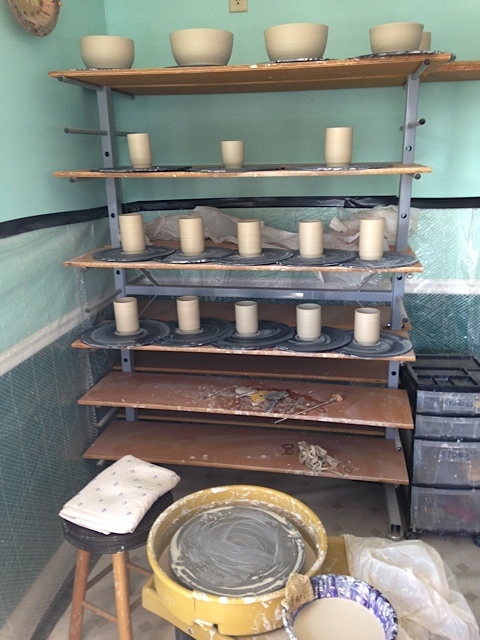 After working out of Nita Lightsey's studio near Montrose and Ah Haa studio in Telluride, she is currently creating from her home and firing at Weehawken's ‘All Fired Up!’ studio here in Ridgway. She enjoys throwing daily vessels as much as creating concept art pieces along with enhancing the already enchanting trees of the forest. You can see many of her faces and signs on the trees in the Enchanted Forest in Telluride. Danelle considers herself blessed to live in Ridgway, finding inspiration every day from our magnificent views to the mundane interactions of daily living. Indeed, she sees beauty in the ordinary, as it is a celebration of humanity. She believes the duty of the artist is to hold the mirror to society that we may reflect upon ourselves to learn and grow. Her latest inspiration comes from her daily interactions with nature, including the local birds as they teach the young to hunt, like the azure mountain blue birds, or gather in the willows and perform a demanding chorus, like the red winged black birds. You can also find her latest series, "Fearless," at the Ridgway Public Library from September 13 through November 7. Danelle believes that, by honoring the beauty around us in our daily vessels, we will be honoring the food that goes in them, and ourselves, saying, "It's not just about what goes into our food, but, also, what goes into what our food goes into." Have your kids gotten to experience our FREE Kids Yoga and Activity Tent? They play, you shop. What could be better? This happens EVERY Friday at the Ridgway Farmers Market. Our first market is THIS FRIDAY! Can you believe that the wait is almost over? The Summer's first market takes place THIS Friday (May 23rd) at Hartwell Park in Downtown Ridgway. 1. The market will run from 10am to 3pm and vendors will not be permitted to make sales outside of this timeframe. Please plan to wait until 10am to start shopping. 2. RFM Board Member Katie Graves will be hosting a FREE Kid's Activity and Yoga Tent from 11am-12pm every Friday so your kids can engage in some fun games and movement while you shop. 3. In the interest of allowing grass-regrowth in Hartwell Park, this season's market will move from the Southwest corner of the park to the Southeast. It's almost here… the summer's first Farmers Market is only 2 weeks away. We are so excited to see you all at Hartwell Park on May 23rd. Please note have new market hours this year - we will open at 10am and close at 3pm. See you in two weeks! Market Starts One Month From TODAY! The Ridgway Farmers Market opens on May 23rd at 10am in Hartwell Park in Downtown Ridgway, Colorado. We can't wait to see you there!